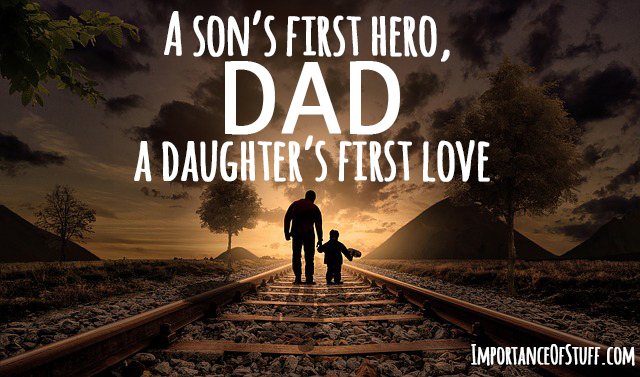 Father: every boy’s biggest hero, every girl’s first love. He held your hand when you took your first stumbling steps. He picked you up when you fell. He caught you sneaking kisses to your boyfriend over the phone, and pretended he wasn’t there. When your heart got broken, he grieved over your loss more than he admitted. And when you lost that job, he quietly transferred money to your account each month. Down the years, through thick and thin, he has been there. No wonder every boy wants to be like his father growing up, and every girl hopes to meet someone who would be at least half as great as her dad. Here’s why our fathers are such incredible people. He is a great role model: Say the truth. Have you ever met anyone this strong, except maybe your granddad? The father is the strongest member of the family, both by choice and by compulsion. Our society is still very much patriarchal in essence, which means there is great emphasis on the man of the family to be the strongest one, hide their weaknesses, and carry on unperturbed in the toughest of times. That is perhaps the greatest lesson we can learn watching our fathers as we grow: how to persevere and be strong for others, even when it seems almost impossible to go on. He is a pillar of support: Of course he is! Each kid knows that the father will be the refuge when the world begins to go wrong, and he is always there to help out. Bad grades at school? He will comfort you and take you to task at the same time. Got laid off from work? He will help you look for the best job for your potential, and help you out with money for the time. Each time life throws you a bad hand, your father is there to pick you up with his unquestioning love and support. He teaches you the importance of relationships, and that family comes before everything, because he puts his family first, all the time. He is a great friend: Sure, most of us talk about the deepest fears and secrets with our mothers. But dads hold a very special place in our lives. When you buy the newest gadget, you run to show it to the man. When you bring your girlfriend to meet your parents, you desperately want her to make a great impression on your father, and to adore your father immediately. You can discuss sports and movies for hours with the man, and listen to him endlessly as he speaks about all the great experiences of his life. He is always ready to help out with money: Your father has always been there to help you out with money. When you wanted a new bike in school, he got you one on your birthday. He paid for college and higher education, and never let you know or understand when money constraints set in. He always made sure you came first, and fulfilled all your demands, even the ones that really burnt a hole in his pocket. Even as an adult, you have never felt any awkwardness whenever you have to ask for money, and he gives you without question, knowing full well that sometimes he will never see that money again. He is the protector of the family: When you think of your father, the image is always of a giant of a man, with the kindest face ever. That is because he is always there to take the bullet for the sake of the family. He drives real slow while taking a family trip. He throws his back out trying to defend you from bullies. And you know, should the unfortunate time come, he will protect you with his life if things come to that. He can be the mother if required: It’s a misconception that dads are there only for the harder bits of life- you know, the money, the accidents, the discipline. But that is not true, really. Children of single fathers across the world will testify that their dads have been great at being moms too. Fathers can handle their children’s tantrums and heartbreaks, showering them with love and affection when needed and remain strict when the circumstance arises. The father is, in every sense of the term, the man of the family. He holds our hand the first time we meet, and never lets it go. If there is one man we can bank on forever, he is the one. He will not be with us forever in person, but in spirit he is eternal. So don’t hesitate to shower him with love, and show him what he means every chance you get. He might not say much, but you mean the world to him.